When Jorge Bergoglio was a young Jesuit, he wrote a statement of his personal beliefs. It began, “I want to believe in God the Father who loves me like a child, and in Jesus, the Lord who infused my life with His Spirit, to make me smile and so carry me to the eternal Kingdom of life.” The elements of this credo inspired the selection and arrangement of the reflections gathered here: Pope Francis’s thoughts on love for God and each other and, most importantly, God’s love for us. Here are his most intimate thoughts about the purpose and promise of love, “the greatest power for the transformation of reality”. Whether you are at the beginning, middle, or end of your spiritual journey, may Pope Francis’s words open your eyes to true love: the kind of love that will never end. This book collects Pope Francis’s thoughts on love for God and each other and, most importantly, God’s love for us. 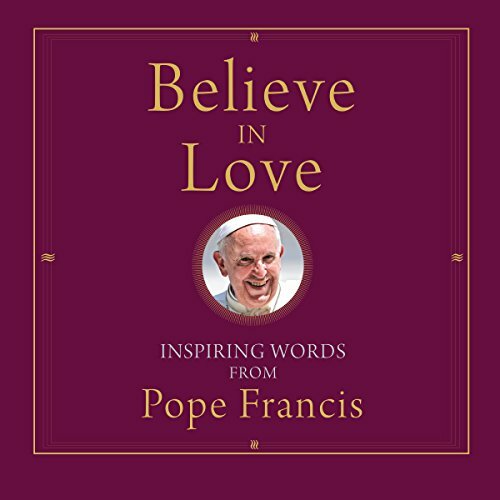 Drawn from his homilies, addresses, and other papal documents, it illuminates a personal “credo” written by Jorge Bergoglio as a young Jesuit entitled “I Believe in Love”.